Are you sick and tired of brittle, fussy hair? Don’t know how the women in shampoo commercials get such luscious locks? We understand, which is why we’re here today! 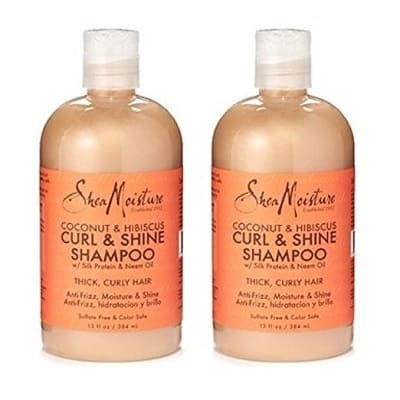 If you want healthy and shiny hair, checking out the best shea moisture shampoos is one of the best things you can do! Here’s a quick overview of the best shea moisture shampoos on the market! 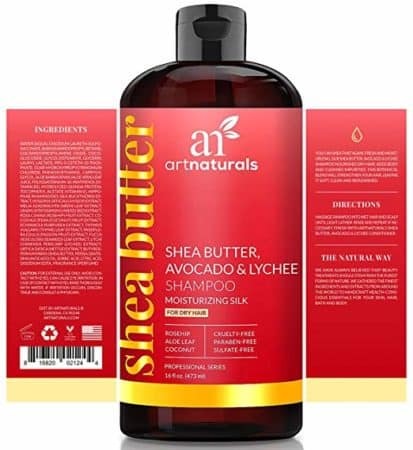 Now that you’ve had a quick look at each of the best Shea moisturizing shampoos, scroll down a bit further to read in-depth about each of the products you want to try! 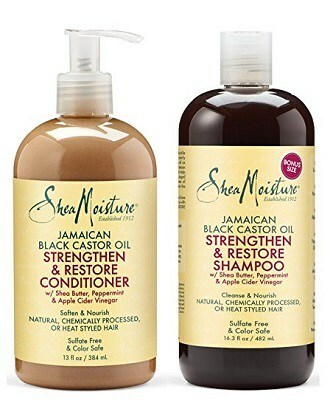 If you’ve looked up any reviews on great shampoos, then you’ve most likely already heard of the Shea Moisture Shampoo of Jamaican Black Castor Oil. Castor oil is used by many, for a variety of benefits. One of the reasons many people love it is that it works to smooth the hair, taming it of frizz and fly-aways. This makes it a great option for hot, humid environments, and also for hair that is damaged. Another benefit is that it helps regrow or improve the amount of hair growth seen. If you’re experiencing hair loss due to damage or over-processing, you’re going to love this duo. We know our list is primarily about shampoo, but this duo is just too great of a deal to pass over. With their complete strengthening system, this Shea Moisture shampoo and conditioner combo work to fortify as well as soften brittle hair, with a combination of a powerful moisturizing ingredient. The reparative conditioner not only uses Shea Butter, but also a variety of keratin proteins and peppermint to smooth and detangle dry hair. 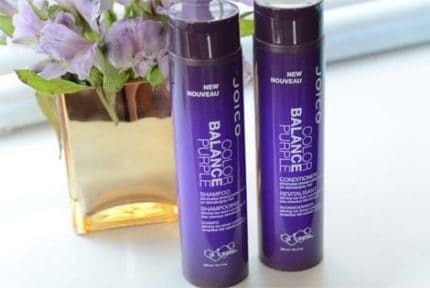 If you have flat hair, you’re also going to enjoy this shampoo/conditioner combo. Thanks again, to the Black Castor Oil, you’re going to experience thicker-looking, more full, bouncy hair instead of lackluster, flat hair. The products are also cruelty-free, as well as paraben and sulfate-free! This is not only great for your hair’s health but also the environment’s! If you have children, you may be wondering which is the product is the best Shea Moisture shampoo for them. 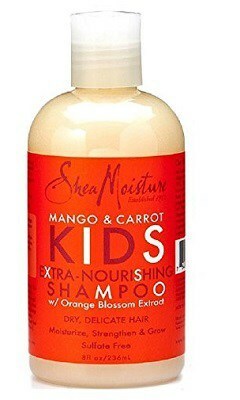 Without a doubt, it would have to be their Mango and Carrot Kids Extra-Nourishing Shampoo. We all have or know a child that doesn’t like to bathe, and getting shampoo in their eyes, and we can’t blame them! Who likes the feeling of their eyes burning? Now your kids can experience healthy, clean hair without worrying about any irritating chemicals. The brand uses recipes used by a healer, but making it more applicable to modern-day life, using the best ingredients from around the globe. If your child has curly hair, they’re particularly going to find this shampoo helpful, as it helps to make sure their hair untangles easily and helps to eliminate any frizz and dryness that can cause the tangles in the first place. It also helps to protect against breakage, so it helps to maintain a certain amount of healthiness in the future, as well. One thing that we weren’t fans of, however, was that when used on thinner or flatter hair, it can give the hair an almost greasy texture. With that being said, we can’t say we recommend it for thinner hair. The smell is lightly fruity, which we personally liked, but of course that’s more of a personal opinion. Do you find yourself browsing through all of the different Shea moisture shampoos on Amazon, but can’t seem to find the right one for you? We get it! There are endless options to choose from; how can you choose the best one? We have to say, that we’ve found one of the best in the Alaffia EveryDay Shea Moisturizing Butter Shampoo. Let’s start off by saying that this product is 100% fair trade, so you can feel good about using a product that is good not only for you but also for the rest of the planet. It’s made with all Certified Fair Trade ingredients, as well! The shampoo works to cleanse in a way that doesn’t strip hair of its natural oils. So many shampoos out there do this; sure, it will make your hair feel clean, but it will also make it unhealthy, in the end, by drying it out. The Shea moisture shampoo is formulated with unrefined Shea Butter, Virgin Coconut Oil, and antioxidant Shea Leaf extract to cleanse your locks in a gentle way so that you still keep all of the important oils. 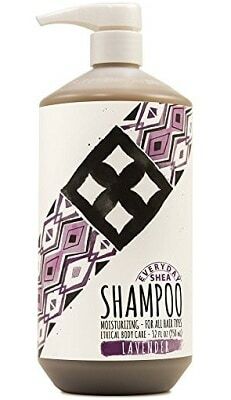 The creamy shampoo is made for all hair types, which isn’t the case with most shampoos out there. It can be frustrating hearing great reviews about a product, only to find out it’s only for a hair type different than yours! You don’t have to worry about that with the Alaffia EveryDay Shea. All proceeds from purchases go towards combating poverty in Togo, and each package is recyclable, so literally, every part of this product is going towards helping to make the planet a better place for everyone to live. Potentially, yes. If you do use more shampoo than the instructions specify, you may find yourself with a slight residue. With that being said, just use the amount on the label, and you shouldn’t have any issues! If you’re reading through the Shea Moisture Coconut and Hibiscus Shampoo Reviews, you’ll probably see that the majority of them are positive. However, you’ll probably also see that they don’t list much about the actual product. If you have curly hair and are looking to have something help achieve silky-feeling locks, then check this one out. The first thing we noticed about this moisturizing shampoo, was the great fragrance. It was a bit tropical-smelling, but not overwhelming to the point of being an annoyance. This product is so great at hydrating, that it even worked to help soften dreadlocks, which can often be a challenge. 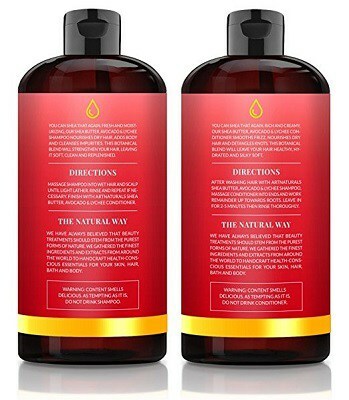 We can’t say only use this product if you have thicker, curly hair, as one of us with thinner hair did try it and had great results, however, another did as well and experienced some greasy residue. Watch your hair become shiny, bouncy, and more manageable with the sulfate-free formula, complete with hand-picked natural ingredients and certified organic Shea Butter. The gentle cleanser features everything you need to make hair more easy to work with, and also works to moisturize and protect hair. The coconut oil is the main reason for the moisture, while the hibiscus extracts and Neem Oil help to improve the elasticity of your hair while simultaneously working to prevent future breakage. Was there anything else we didn’t like? One more thing! We didn’t like how runny the shampoo was; the texture felt fine in our hair, but it was more about making sure it didn’t just run into the drain before it had the chance to be applied to our head. If you have seriously damaged hair, whether from chemicals, mother nature, or blow drying your hair, you’re going to need something that will help restore the moisture that’s been lost. The Art Naturals Shea Butter Shampoo and Conditioner Set will help you get there. The duo features a combination of super hydrating and restorative botanicals, including Shea Butter, lychee extract, avocado oil, as well as a bunch of other helpful ingredients. Both of the products use Shea Butter, which is the ultimate product if you’re serious about hydrating just about anything. It not only does that but also helps to soothe dry, irritated scalps, which can help solve potential dandruff problems. It also works to repair any breakage or split ends you may have. Vitamins A and E also assist in the restoration project, and help to moisturize all the way from the scalp to the ends. If you’re out in the sun a lot, you’ll love how it works to protect against harmful UV rays, salt, and also chlorine. If you’re a swimmer you know how helpful this is! If that weren’t enough, Art Naturals went ahead and also added avocado oil. When you hear the word “oil” you may start thinking of greasiness, but this oil is actually very lightweight and easily absorbed, so you shouldn’t have to worry about it making your hair greasy. The price point also is pretty low for a shampoo/conditioner combo that really works. The only thing we weren’t fans of, was the smell. It definitely wasn’t overwhelming; in fact, it was barely existent. So, if you like a scent, maybe think about that. Now that you’ve finished up looking at all of the best Shea moisturizing shampoos out there, you may still have some unanswered questions as to what you need or what you should be looking for in a shampoo. That’s why we’ve gone ahead and created a quick buying guide below to help you find the best one for you! The first thing to consider when purchasing a new shampoo is what kind of hair type you have. If you have thick hair, then make sure to get something with ingredients that are catered to that. They can help make hair more manageable and help with tangles. 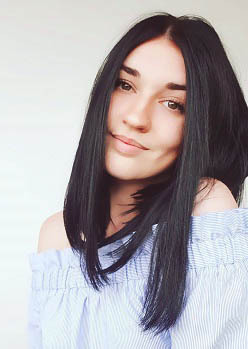 If you have thinner hair, make sure the product you’re interested in isn’t going to weigh your hair down or make it greasy-feeling. This can often happen with moisturizing shampoos, but it’s not a rule. It’s always better to go with all-natural ingredients; for many reasons. The first obvious and important reason is that it’s just overall healthier not only for you and your hair but also for the planet. Secondly, it’s also much easier on your body. When a bunch of foreign chemicals is added in, we don’t always know what effect they’re having on us. In addition, they have more of a likelihood of causing allergic reactions in those with sensitivities. It’s important to make a budget as to how much you want to spend before you start looking, that way you don’t spend more than you want. However, also take into consideration how large the bottle is, and how long it’s going to last. Some of them can be pricier, but you’ll find that it will last you a lot longer, which ultimately will make it equal in price to some of the less-expensive options. Many people don’t think about this aspect when purchasing a Shea moisture shampoo, but no one is going to want to use a product that makes their hair smell like something they don’t like. Oftentimes, we like the smell of the product, but the scent is just too strong and ends up becoming unwelcome to our senses. So, in the case of purchasing online, it’s best to just read the reviews. We’ve made sure to mention the scent if we think it could be a problem, or if anyone had an issue with it. We have to say that each of the Shea Moisture shampoos we used was of very high quality, and depending on your hair type, they are all wonderful. 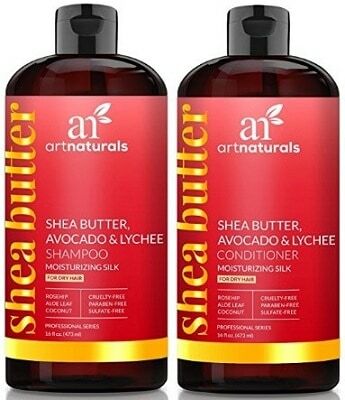 However, we did have one favorite, which was the Art Naturals Shea Butter Shampoo and Conditioner Combo. First of all, we loved the fact that it was a combo, so you know that the two products work well together. They’re also marked at a very affordable price point, and in addition to that, you only need a small amount for it to cleanse. The ingredients are all-natural, which is great for everyone. It’s a perfect option if you or someone else in your home has skin sensitivities. It works great for moisturizing, repairing, and also protecting hair against potentially harmful chemicals and situations. So, which of these best Shea moisture shampoos sounds like your cup of tea? Let us know!